There is a new Korean restaurant located on a lovely side street (Cardero) about ten steps away from hopping Robson street. A welcome-chalkboard beckons as you turn your back to Robson’s city sounds. Walk the few steps under the tree lined street filled with birdsongs. You have arrived at Kosoo – Korean Kitchen + Raw Bar. The interior of Kosoo Korean Kitchen instils a sense of peace. This is precisely the goal of designer and co-owner James Lee. James Lee has been designing restaurants for many years and he relies on his military training when it comes to order. With Kosoo Korean Kitchen he incorporated his spiritual philosophy for flow, and his artist’s passion for nature and natural wood. Pure white boards meticulously calligraphed with sweeping black ink instil images of nature. To complete the welcoming feel of the room, authentic Korean pottery sit on walled shelves. There is also a framed Korean costume with gorgeous detailing on a feature wall. 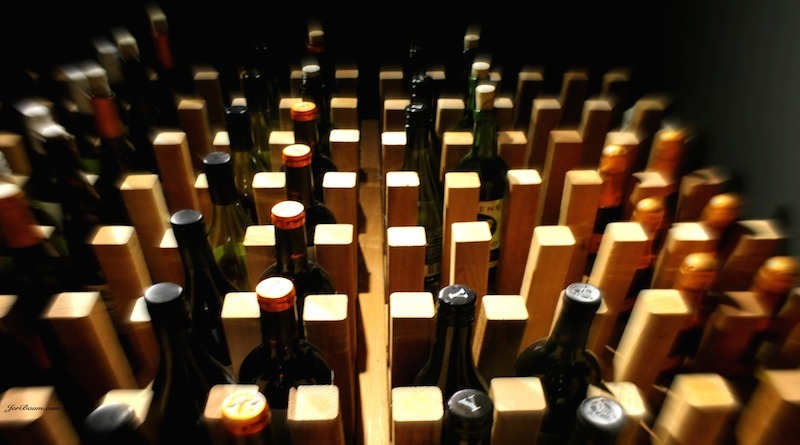 The wine rack is constructed of natural woods that looks like intricate art but is completely functional. Kosoo roughly translates to “Master of the First Principle” and also means “To Sustain”. Meet Chef Han and you will quickly realize that he exemplifies the word Kosoo, in all its translations. Chef Han’s, executive chef of Kosso Korean Kitchen, fascination with food began in his early childhood days when he was allowed to sit in the kitchen to watch his mom prepare family meals. It was not just the daily meal-making he was enthralled with, nor the time spent with his mom. He was intrigued by the time labouring ingredients – the making of kimchi, soy sauce, and chilli pastes. Today Chef Han makes his own kimchi and chilli pastes, and if he could he would make his own soy sauce, just like his mama did. The menu reflects his passion – he trained in Japanese and French cuisines – combined with love for his Korean roots. Chef Han describes Kosoo Korean Kitchen + Raw Bar concept as “Modern Korean”. Food that is created for guests to experience true Korean foods with a western flair. Fresh ingredients, from local BC producers, are delivered daily at the kitchen door. Vegetables arrive in the morning, fresh kimchi is uncovered, fresh fish is delivered directly to the kitchen door. Chef Han said he loves working with the consistency of local, fresh products. Try the lunch specials, or bowls of noodles and soups. Or, oh goodness me, the Raw menu‘s mouthwatering items. Bocconcini Wrap – soft, creamy bocconcini wrapped with prosciutto and topped with tomatoes and a crisp parmesan tuile. Served in a fragrant and light Korean kimchi and made-from-scratch tomato purée. Salmon Caprese – Smoked salmon with bocconcini, tomatoes, and balsamic reduction. There is a sense of familiar and surprise in this dish. I love how Chef Han can harmonize the rich cuisine of Italy with the soft lightness of Asian cuisine. Matcha Crème brûlée – pure creamy custard topped with seasonal blueberries and presented beautifully. The best way to end the meal should always be like this – it should be pleasing to all the senses, light enough to keep the tummy happy, and of course it should instil one with the firm resolve to return as often as it takes to taste through the whole menu. The rest of the menu will take you on journeys you have never tasted before. For me everything I tried seemed familiar, yet pleasantly surprising, There is nothing jarring about Kosoo Korean Kitchen + Raw Bar. From the location to the space, and the people, to the plates and bowls of lovingly created foods. My advice is to – Do the entire menu with a group of friends or opt for à la carte. There are so many dishes to choose from – every single dish is carefully built from the ground up with 90 percent local ingredients, love, and beautiful energy. Go check out Kosoo Korean Kitchen + Raw Bar and give us your feedback.